It has been about 9 months since we rescued Chevy, whom we have renamed Dominic. Dominic has molded to our family beautifully! He enjoys playing with the boys (ages 5 and 8) and taking walks. This spring Dominic has become a regular on the Great South Bay. He is usually the first one on the boat and the last one off. He enjoys swimming in the ocean and watching the wakes. We are grateful that Dominic has become a member of our family. He is a sweet boy that likes to cuddle and give kisses. When we leave the house he walks us to the door and eagerly awaits our return. He is a wonderful dog! 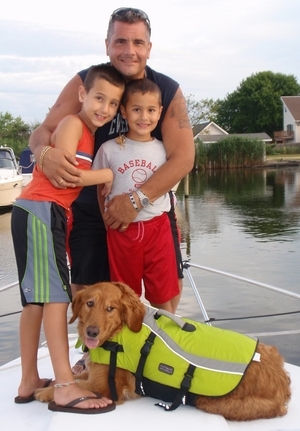 Here is a picture of Dominic in his life jacket on one of our recent trips on the Great South Bay!